Subproject in the DFG research unit "Resilience, Collapse and Reorganisation in Social-Ecological Systems (SES) of African Savannas" (FG 1501). 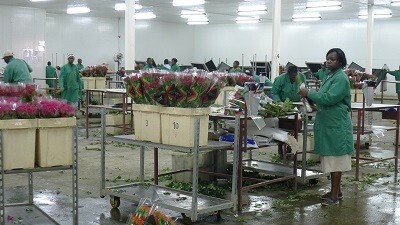 The booming cut flower production is a driver of change in the social-ecological system (SES) of Lake Naivasha. The new project B3 focuses on the agro-industrial complex with the aim to explore the entanglements between global economic influences, local social dynamics, and their impacts on resilience and reorganization of the local SES. With regard to the overarching conceptual framework of the research unit, project B3 challenges the inherent 'spatial fix' of SES-approaches by extending the view into two directions: First, the territoriality of SES and resilience concepts will be critically assessed by taking a multi-scalar perspective that views locally confined systems in wider spatial contexts. Secondly, the project will address the social aspects and coupling effects of the local SES by explicitly focussing on social dynamics as a consequence of global influences. The project is organized into two parts that take the cut flower industry as the place of articulation between global and local processes. The geographical contribution (part A) focusses on the global value chain (GVC) of flower production and marketing. The key question of part A is how the GVC influences local processes in Naivasha. The guiding questions aim at three issues: (1) the governance structure of the GVC (role of economic actors and drivers, institutional setting, standards); (2) the direct impact of the GVC on cut flower farming in Naivasha (i.e., farm organization, specialization processes, production); and (3) the functional relationships and interactions between flower farms and their social-economic environment (i.e., formal and informal arrangements between big farms and smallholders, competition over land and water, knowledge transfer). The highly dynamic social organization of workers in the flower industry will be the focal point of anthropological research (part B). The key question of Part B is how laborers in the flower industry establish new patterns of social organization focused on wage labor with strong ties to one industry (and perhaps single employer), patterns of social organization in respect to industrial employment and urban (or quasi-urban) settlement, i.e. to what extent an industrial proletariat emerges. Guiding questions address three major issues: (1) the organization of labor, including the recent establishment of trade unions; (2) its consequence for household economies, community building, and social dynamics in the new settlements, for example with regard to the increasingly important role of (fundamentalist) churches and the Kikuyu led Mungiki sect, or the role of ethnic divisions; and (3) the translocal connections between the labor dynamics in Naivasha and social and economic processes in other parts of the country, for example with regard to extensive family networks.